PlaceIQ is delighted to announce that we have been named an Oracle Data Cloud Premier Data Provider in the launch of a new program aimed at identifying companies that are considered to be trusted leaders in the data ecosystem, and who they feel are similarly invested in moving the industry forward with innovative data strategies. 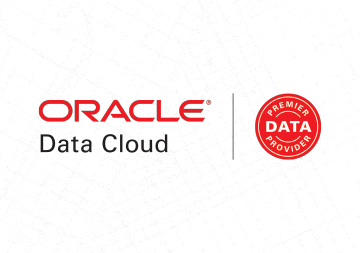 In a crowded marketplace, where marketers have dealt with information overload and no easy way to distinguish datasets, the Oracle Data Cloud Premier Data Provider Program seeks to help marketers work with data providers that a) have demonstrated data accuracy and transparency in their data assets, and b) bring new and differentiated solutions to market across applications and use cases. We couldn’t be more excited about working with Oracle and our collective clients, to bring solutions to market that drive business results. We’ve spent the last eight years refining our dataset, which makes its insights (and the data itself) a unique industry offering. PlaceIQ’s LandMark provides a real-world based view of the consumer journey, connects with a brand’s own datasets, and can connect multiple marketing touch points for a truly integrated marketing approach. This is the patented dataset that underpins our relationship with Oracle. Over the past four years, Oracle Data Cloud and PlaceIQ have jointly worked together to deliver new and innovative data solutions and unique data targeting opportunities for marketers, with a focus on leading-edge ways to help brands acquire and retain customers. PlaceIQ has aligned our goals to build, scale, and offer the industry’s most trusted location data, while always adhering to the highest standards you would come to expect from Oracle. The results? Best-of-breed, sophisticated, quality data solutions that drive positive, meaningful, and measurable business outcomes for our clients. Our legacy and passion for developing the most authoritative, comprehensive location intelligence solutions are being recognized with this honor. We look forward to continuing our journey with our world-class partner, bringing growth to premier brands across our industry. Goethe once said, “Tell me with whom you associate, and I will tell you who you are.” At PlaceIQ, we believe that adage to be true, and as such, we are particularly proud to be in such good company — PlaceIQ is one of only 18 data providers to be selected by Oracle, and the only location intelligence provider to receive this honor. Further, we are pleased (but not surprised), to see some of our long-standing partners also receive this status from Oracle. Businesses we’ve trusted to share our data philosophy — like Comscore, IHS Markit, and Experian. By virtue of this shared honor, we look forward to unique opportunities to collaborate with them to the benefit of our shared clients as well. Reach out to learn more about PlaceIQ on the Oracle Data Cloud.